There is a hierarchy of circus acts – and this stays true within the subgroup of animal circus acts. Nowadays, people think first about cruelty when they hear of animals travelling with the circus. During this time period though, especially in far flung small towns, it wasn’t uncommon to have never seen even a photograph of an elephant. 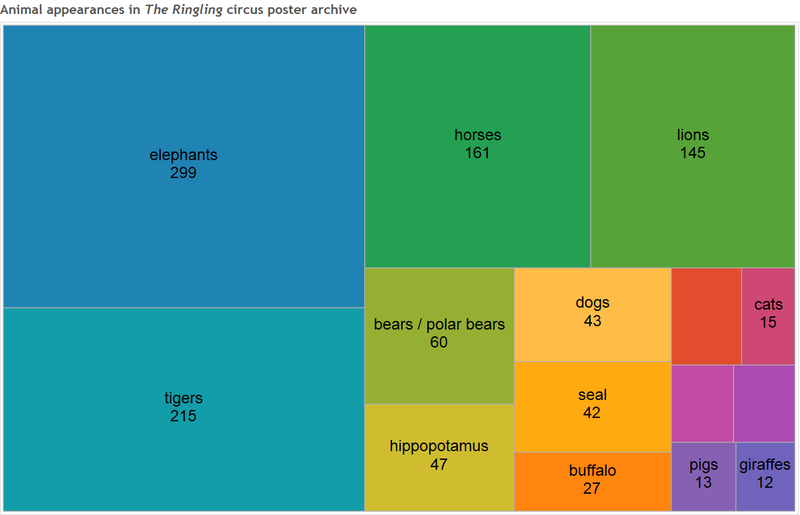 I think this access to the exotic is apparent in the animal hierarchy of The Ringling’s poster archive. The other factor worth recognizing, is represented by horses/buffalo in the archive. I think the est explanation for this is in line with the larger prevalence of ‘Wild West’ shows in the era.